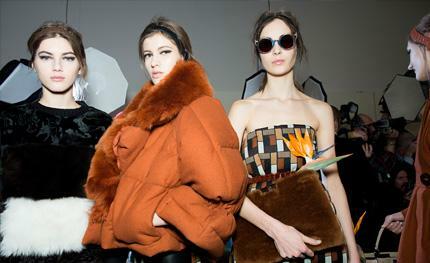 Mood board: Karl Lagerfeld's arty approach at Fendi yielded graphic blocks of cherry red and tobacco browns, not to mention outsized volumes and layers for next winter. Architectural panels were created from raw cut leathers with pockets that looked like workman's aprons and chaps. Best in show: A geometric printed dress made of tiers of puffed wool looked like a party dress and sleeping bag all-in-one. Finishing touches: Pleated leather headbands were fun, but best of all were the colour blocked pony skin pouches with birds of paradise flowers (made of coloured feathers) peaking out like spears.